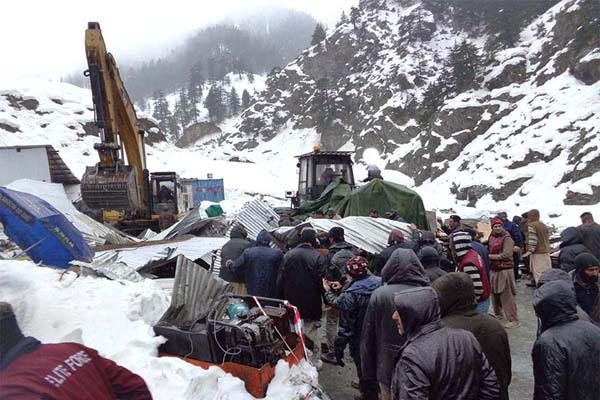 CHITRAL, Feb 19 (APP): As many as seven died and similar number injured due to land sliding and avalanche in Ziarat near Lawari tunnel in chitral district. The deceased and injured persons were mechanics and technical staff of Sambu Korean construction company. of a workshop of SAMBU construction company of Korea, working to construct 8.5 km long Lawari tunnel. and recovered seven dead bodies and seven injured from the debris, who were rushed to Teaching Hospital of Peshawar. According to DC Chitral those who died in this incidence were identified as Rahmat Zada of Drosh,(Chitral) Jalal Khan resident of Drosh, Rahmat Ghazi of Drosh, Nadeem Khan of Punjab, Haji Iftikhar, Kamran Khan and Muhammad Asif residents of Punjab. Dhameer Arando Chitral, and Bahadar Wali of Drosh Chitral. few years back as a result 7 soldiers had died as well as 4 people had died by avalanche in this area in 2014.
avalanche but people of the house survived miraculously. DC Chitral added that roads of Arkari valley, Broghul Kan khoon are still blocked due to heavy snowfall and we are trying of our best to open them very soon.